4.3 out of 5 based on 108 bloggers and 21 commenters. 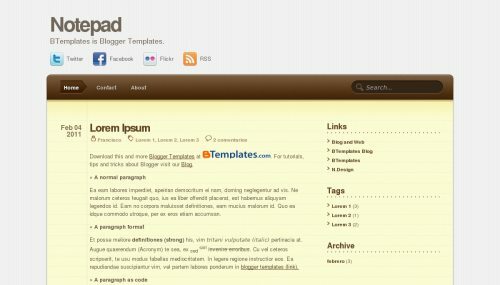 Notepad is a free premium blogger template adapted from WordPress with 2 columns, right sidebar, web 2.0 design, rounded corners, grunge style, social bookmarking icons, girly looking, floral motifs and vectorial elements. Excellent template for blogs about art, books, business, to write a diary, internet, kids or science. Francisco I did this template too…. I tried to make some changes in way to look different from this one. Fabulous template, currently using. :) I have a question, though and hope it’s okay if I ask here. I want the navigation strip to be visible, so I deleted the code that made it hidden. But I would also like the strip to spread out over the entire length of the page, as it did with the standard templates. Any suggestions on how to go about that? Thanks! Wacht my blog for more details! Great, very well designed template! This is indeed a very nice templet. I installed it through Safari. It looks beautiful. HOWEVER, when my friend opened it with IE. It is misplaced. Anyone who can help me? @Medusa: Click on the “Template Settings” link above. Thanks Claudia for your promptly response. Ahora el problema q tengo es la barra del menu aparece por la mitad de la pagina y at the top. Y no esta visible el background marron del menu…Podrias ayudarme con esto? How do you put buttons “Add This”? How do you change the width? hi, i’m using notepad theme on my blog (klodian version). I had problem with this template. I cant edit contact menu to other longer name. I also want add one more menu, but the search box had not prefectly align. Please help me. Thanks. @raziq: We only can give support to users of this version. If you installed Klodian’s version of this template, please contact the author. thanks claudia. I’ve try this version. Don’t think that just copy-past will work.